Tuesday, June 11, 2002, 3:00 p.m.
Good morning. My name is Carol Schwartz and I am Chair of the Council's Committee on Public Works and the Environment. The time is now ____ p.m. and I wish to call to order this Public Oversight Roundtable. With us this afternoon are Committee members _____, _____, and ____, as well as Councilmembers _____ and _____. The Committee is meeting today to conduct an oversight roundtable on the Department of Motor Vehicles' new Destiny computer system. Implemented since late April of this year in a limited version, Destiny as I understand it will be in full operation by early Fall. The Destiny system is perhaps one of the most eagerly anticipated computer upgrade projects this city has known, and certainly one of the most highly touted projects. I sure know that in recent months, going on 2 years perhaps, anytime I inquired about various customer service complaints, the response from DMV - was always, "just be patient and wait for Destiny." And I did. And Destiny is here — albeit in limited form. And what a mess. Sure DMV has -- and probably will continue to -- put its most positive spin on the matter. In fact at a press conference yesterday, Mayor Williams said, "in order for a pearl to develop, there is always a lot of friction in the process." Boy-oh-boy, is this turning out to be one costly pearl! While I am certainly far from naive enough to believe that such a major new system would not have any kinks needing repair or tweaking, I think that what we have seen so far is a little more than a few kinks. To that end, my staff and I began looking into the genesis of the system we are here to discuss today. What I found out in the midst of our research is certainly very troubling to me and begs many questions. And, I will be posing those questions to officials from the Department of Motor Vehicles and the Office of the Chief Technology Officer. After waiting an hour to replace a lost driver's license, a gentleman said, "I've gotten out of here in less than a half hour before. I don't know what the problem is, because it seems there are the same amount of workers here. It was a lot faster the last time I came. I have to go back to school now. " A woman who waited for 6 hours with her grandson to pick up a new registration for her car said, "1 was hoping to be done by 5: 00 because my daughter's car is in the shop and I was supposed to pick her up from work. I know it's not the workers' fault but I wish there was something to make this faster for people." A group of people in line for four hours began applauding every time another customer got what they needed and could head home. "We've been here since noon, so we thought we'd do something constructive with our time. We started clapping for people after they got finished with their business, but a DMV supervisor got mad at us and said we were distracting the workers." A 16-year old trying to get his driver's license wasn't going to give up-no matter what, "I was here last week and they closed before I could get to the front of the line. I've seen the stories on the news about how crowded it is, but I have no choice." There are countless other quotes I could rattle off. We've all read them in the paper heard them on the news. As I said, the quotes I just read were from people disgusted with the new system that the DC DMV - now has. However, the people being quoted were not talking about the DC DMV. They are residents of the State of Nevada -- home of Project Genesis, the state's then brand new DMV computer system -- which debuted in September, 1999. DC's system is the very same system tweaked a little to meet the needs of District laws that caused utter chaos and turmoil in Nevada for almost 3 years. Turmoil that resulted in the replacing of the DMV Director, and the State Legislature conducting hearing after hearing after hearing, culminating in an October 2000 Post-Implementation Review of the system that confirmed the failures of the Project Genesis design. Failures -- I might add -- that are eerily similar to those being seen in our Destiny system. I have copies of that Review, as well as press articles, which I will now distribute to my colleagues present. Many in Nevada's State Legislature suggested completely scrapping Project Genesis, but the Governor refused, saying it would be too costly and time-consuming to enter the new data from Project Genesis into the old system-essentially making the State and its citizens captives of the new system. As I understand it, DC DMV's Destiny system was to have made our citizens less captive to historically time-consuming visits to the DMV. I surely hope we are not about to become held captive for three or more years by a system that failed so horribly in Nevada and took years to bring resolution to its failures. I am aware that during the initial phase of training for DMV staff on the Destiny system that staff were frustrated with the complexity of the system, and with Deloite for not understanding their frustration. This frustration was caused by a system which is far more intricate than the old. While some degree of difficulty is to be expected in learning anything new, such a night-and-day change to me seems overwhelming. I understand also that during a conference call between DC DMV Information Technology staff and their counterparts in Nevada, when asked what the worst thing was about the system, Nevada's response was, "that it's here." Please excuse me for jumping around here and seemingly straying off topic, but I have to go back to something I said earlier. And that was, "why didn't we know about this?" According to Chief Technology Officer Suzanne Peck at the Mayor's press conference yesterday, the Destiny project has been functional since August of 2000-and by my calculations, that's nearly one year after Project Genesis' disastrous debut in Nevada in September of 1999. I want to know who wrote the specifications for the request-for-proposal (RFP) on this contract. I want to know who competed for this contract. I want to know what sort of research was done on the companies that bid. I want to know how when Project Genesis brought the State of Nevada to its knees immediately after its debut this government ever considered, let alone bought into this joke of a system. Now, some of you in attendance today may think that's awful blunt, but I'm sorry, I intended for it to be. I would also like to know why with an approved budget of $17.7 million for FY 2003 and 112 employees, why our own Office of the Chief Technology Officer (OCTO) could not develop such a system. In the FY 2003 budget book, OCTO brags about the ranking of the District's website as the 4th best overall in metropolitan areas in the country. I would much rather brag about having one of the best DMV's in the nation, and I do not think we can ever achieve that ranking with Destiny at least not anytime soon. Just when you think this government is actually making progress, and leaving behind the mistakes of years past, out crops another fiasco, and friends, this is a fiasco. In that vein, I have written to the DC Auditor this afternoon and asked that she conduct an audit of the request for proposal and procurement process of the Destiny system. I have been alluding to the fact that it took Nevada nearly three years to resolve its problems with Project Genesis. Based on a phone call to Nevada DMV Director Ginnie Lewis, and a letter she faxed to me, the State is finally pleased with the system -- nearly three years later. Now that Nevada's system seems to be squared away according to its DMV Director, one would think that my fears would subside. To a certain extent -- a very minor one -- they have. However, what concerns me most -- and no doubt my colleagues as well -- is the fact that the District Government procured a system known at the time to be a colossal failure. We should have known about the myriad of failures in Nevada prior to Destiny's procurement. And, if we did know about it and still pressed on someone has some serious explaining to do. Mayor Williams, Ms. Newman, Ms. Peck... do the citizens of the District of Columbia deserve to endure three years of friction so that Destiny can develop into a beautiful pearl? It is my fervent hope that my fears can be assuaged today. I hope that the Genesis of Destiny does not become a three or more year laughing stock of our great city. We do have more to discuss today then just the process which resulted in Destiny coming online. We will also be speaking today about the large cache of backlogged parking tickets unknown to DC DMV's old system, but now in the picture again because of Destiny. Citizens who have for years renewed drivers licenses and registrations without problems are now being made aware of old parking tickets some dating back as far as 1980 (22 years ago) -- which DMV is insisting be paid before any further renewals. This type of public policy, coupled with the cavalier and sometimes downright uncaring and condescending attitudes of some DMV staff -- including upper management -- to both our citizens and Council staff attempting to help those citizens, will be thoroughly questioned. While I do not think people should not be held accountable for their tickets, there has to be a statute of limitations established. Some have suggested three years... some five... some ten. I know that three years is out of the question for me. I could never support that. As to the perfect date, I believe that is a discussion that should -- and will be held -- by the entire Council, after a full public airing of the matter. It is my hope that those in attendance today will offer their recommendations for a statute of limitations date. The normal procedure for this Committee has been to have public testimony followed by that of the Executive Branch. Today, however, I am going to reverse that order so that we can hear from the Executive, right off the bat, how it plans to address the problems now plaguing the DC DMV. I now turn to my colleagues for any opening remarks they wish to make. I would now like to ask Sherryl Hobbs Newman, Director of the DMV, and Suzanne J. Peck, Chief Technology Officer, to come forward. Good afternoon, Ms. Newman and Ms. Peck. I would like to ask you both and any member of your staff who will speaking today to stand to be sworn in. "THE DEPARTMENT OF MOTOR VEHICLES' DESTINY COMPUTER SYSTEM"
Good afternoon, Council Chair Schwartz, Councilmembers, fellow DC residents. My name is Sherryl H. Newman and I am the Director of the DC Department of Motor Vehicles. I am here today to inform, educate and correct some of the misunderstandings and misnomers that have prevailed over the last few months regarding the new computer system and the agency's performance. With me today are the City's Chief Technology Officer Suzanne Peck, and the Deputy Director for DC DMV, Angell Jacobs. Together it is our intention to answer your questions, address your concerns, and leave you with a sense of what has happened, what is happening and what will be happening as we continue to move this agency forward. Recent media reports have introduced topics such as ticket issuance and payment, overpayments, faulty computer operations, and dissatisfaction with service delivery at the department. As is often the case, not all of the story has been told for there to be a clear judgment on the situation. Many are jumping at the opportunity to criticize, without being able to fully understand or appreciate the challenges and issues that must be addressed. This is some of what we will discuss today. In addition, many citizens have come here today or were invited to share their experiences. Their stories speak to the difficulties that they have faced and the dissatisfaction with the present system. It is unfortunate that those residents that continue to have good experiences are not here today, and there are many. In fact, for every one that complains, I can tell you that there are many who have found the service to be superior and have encountered nothing but professional, courteous, and dedicated staff. Today we will discuss some key areas of DMV, past, present and future. We will begin with the mission of DMV and its operations. We will then speak to the commitments made and the promises kept. A demonstration of Destiny and its many attributes will come next. I will address many of the issues raised here today and in the papers. Finally, I will conclude with where we are headed and next steps. Good afternoon. My name is Angell Jacobs, and I am the Deputy Director of the DC DMV. As the Director has said, we'd like to use this hearing as an opportunity to not only answer questions, but as a means of educating the public about the DMV. The mission of the DC DMV is a noble one. We strive to fairly and equitably develop, administer, and enforce the vehicular laws of the District of Columbia for residents and non-residents in order to ensure public safety through the safe operation of motor vehicles. As we follow along the road to complete our mission, there are clear guidelines about what we do as a department and what we don't do. I will outline for you what those are. The DMV issues driver's licenses/non-driver's id cards, conducts medical reviews, issues driving records, registers and titles vehicles, inspects vehicles, issues residential parking permits, conducts hearings by mail and in-person, accepts ticket payments, and administers the ticket processing contract. DMV does not boot nor tow vehicles, issue tickets of any kind; manufacture or post street signs; regulate or enforce metered or residential parking; manage or administer the photo enforcement contact; have legal authority to dismiss or waive tickets due to age; enforce the ROSA program for out of state vehicles, or issue visitor parking permits. By clarifying what we do and what we don't, we hope to begin the process of setting the appropriate levels of expectation of our customers. Starting in July of 1999, under the stewardship of Director Newman, the agency made certain short and long-term promises to residents. We promised greater access to DMV services, and delivered three new customer service centers, which overall provide more operating hours and more locations to perform full service transactions. Additionally, we have increased payment options by accepting credit and debit cards at every window, and allowing ticket payment by phone and internet. We opened an express office for renewal transactions, and installed neighborhood drop boxes for tag surrender. We pledged to provide better customer service and better customer communication. To that end, we removed the glass from all service windows to provide a more friendly environment. We provided customer service and diversity training for all staff. We send out renewal reminder notices for driver's license, vehicle registration and vehicle inspection. An updated website, phone system and brochures serve as a multi-media approach to prepare customers to successfully transact business at the AMV. We promised special services. There are senior citizen lanes and a child car seat fitting station at the inspection station. Knowledge exams in different languages and the AT&T language line for non-English speaking residents. We committed to greater security functions; we gave you a digitized driver's license that is bar--coded and contains other security features that make it difficult to counterfeit. Computer-generated driver's license numbers protect the integrity of the citizen's social security number. The new window registration sticker is intended to reduced theft of the license plate sticker. Finally, our biggest promise was to implement a new integrated motor vehicle information system with enhanced online functions. That system is Destiny. This computer system will address many of the problems and difficulties that we have had over the years. Let us be clear - once again - about what it will and will not do. It will create an ease of transaction and access to DMV operations. It will give residents better access to services and a wider variety of methods to interact with DMV. It will create a greater sense of security for all documents and inventory. It will help to safeguard against fraud and theft. it will ensure that the right people are driving the safest vehicles at all times. It will not solve all of the problems that the agency or this government faces. It will not be the answer to all of the past and present issues we are facing, nor was it ever intended, suggested or designed to do so. To educate us on what Destiny is and what it can do is Suzanne Peck. The Chief Technology Officer. Now that you have seen some of what Destiny can and will do, let's talk about the challenges we have faced in testing this comprehensive system. As we discussed at previous hearings, Destiny was designed to consolidate information from 22 previously independent systems. In doing this, several pieces of information are now available in one place. This includes the consolidation of the registration and residential parking permit stickers, the ability to track documents from one location to another, the ability to make global changes to one's information without having to repeat inputs, and more. This also has meant the incorporation of various other systems, including SSN verification, check and credit card verification, and most notably the ticket collection system. Knowing that these things were about to happen, we stressed in hearings and at press conferences, that this testing period would produce long lines for a short period of time, and this has come to pass. However, we also said that this would be resolved as we progressed through the test period and we asked for support, cooperation and patience. Ladies and gentlemen, as you have heard and many of you have experienced, no major system of this magnitude can be designed and implemented without some stress on the staff and the customers. We have developed a test period that will allow us to implement pieces at a time and cause the least burden to all, but there is a burden nonetheless. This is not a reason to declare defeat and state that the system is faulty and broken/Destiny is working as it was designed to work, and is performing well. We have found the test period to be invaluable in that we have determined things that were not developed in design, we have seen outcomes that were not anticipated in development, and we are changing things based on customer interactions that were not planned. What we must do now is respond better to what is now a state-of-the-art system, and utilize it to its maximum potential. Destiny will take us further than we have ever been and it will enable us to move forward. Many issues have been raised about services and operations within the agency. I would like to take a moment to address some of them. Often customers have complained that they have not gotten their notice for the renewal of their license or registration. We have notified the public and apologized for specific problems that we have had in the past, and attempted to remind everyone that the receipt of the notice is not guaranteed. While we would like to promise that everyone will receive their notices, we cannot. The historical problems of receipt in some areas of town are well-publicized and documented. This will not change based upon anything that we do. Everyone must be responsible for ensuring that their business is up-to-date, regardless of receipt of the notice. Destiny will now give us the ability to tell you when the notice was mailed, and even print a duplicate, but it cannot guarantee receipt of the notice. And now there is even a new Inspection notice that is going out. Still, the obligation stands, and no violation will be dismissed due to failure to receive a notice. The message is clear, though. Keep track of your registration, license and inspection dates, and be on time, notice or no notice. With the implementation of Destiny came the advent of longer lines and outcries about the new system. Yes, we had a problem on 5/3 that caused us to shut down for a few hours. However, since then we have had no computer problems. So why the long lines? The answer has to do with the changes that Destiny has put in place regarding the payment of all fines and obligations. If you take a poll, a significant number of people will say that they waited a long time, but their actual transaction time was short. This is due to the staggering number of people with outstanding tickets, fines or stops on their record. In fact, one out of every three people has some type of issue that needs to be addressed, whether it be unpaid child support, bounced checks, unpaid tickets, lack of insurance, violations from other states. DMV was never before able to determine liability the way it can with Destiny. This is a good thing. After all, our process says that we will do our own enforcement by preventing you from conducting business if you have anything that needs to be resolved. The problem is that this process was never working 100% of the time, hence the ability of people to renew year after year. So what is the answer. Two words: BE PREPARED. If everyone comes to DMV with their correct paperwork, and all of their obligations fulfilled, there will be shorter waits for every service. We must get the word out. Begin a pre-screening process that will allow us to determine those who have no outstanding issues and move them through quickly. Now this will mean longer lines at the information desks, but it will mean faster service in the long run. By the end of June, letters will be mailed to all DC residents who have outstanding tickets. This will allow them to look into their accounts and take care of their business before they are scheduled to renew. We are committed to ensuring that those who have done what they should, are not penalized behind those who may still have things to take care of. We realize that this is a problem, and we feel that the screening and notices will address it. The 1998 DC Auditor's report spoke to over $17.8 mil in refunds that were due to customers of the Bureau of Motor Vehicles, then part of DPW. My investigation has revealed that there was an effort made to present a proposal to refund the monies at that time. It is unclear, however, as to why this did not occur. In 1999, when DMV became an agency, there were two officials within DMV who presented a plan to the City Administrator regarding the process for refunding the movies. This too was not acted upon, and the officials from both offices are no longer here. In 2000, DMV began working on an automated process for dealing with refunds that occur due to various reasons, including double payments, refunds created as a result of an appeal, double payments made to ensure time sensitive issues are addressed, etc. This plan became a reality in November 2001, when the first letters were mailed regarding overpayments. In January 2002, another mailing was conducted and a third was done in April 2002. To date, over 25,000 letters have been mailed informing customers of their overpayments and our intention to refund the monies. The only requirement of these individuals is to send us proof of identity, no proof of payment is required. As of June 7, 2002, 11,500 people have responded, and 8,400 checks have been mailed. The issue of the overpayments is a complex one that needs clarification. First, this is not a case of over-billing. That would imply that people are being charged too much. This is a case of over or double paying a fine or penalty. Second, this is not something that can be eliminated. As many other jurisdictions have stated, overpayments occur daily for various reasons. This cannot be avoided. What we must do is create a mechanism for refunding the monies, and we have done that. Our new automated process highlights payments that need to be moved to outstanding tickets, checks all of those for accuracy before applying them, moves the overpayments, generates letters to notify customers of a possible overpayment, and will generate checks for remaining overpayments. This is done before the 10th of each month. The information sited in the 1998 and 1999 audit reports included such things as inappropriate fees being collected, inappropriate actions by officials in the dismissal of tickets for citizens and elected officials, and the incorrect imposition of fees due to the inability to record payments timely. These have all been reviewed, and our investigation has found that the findings and recommendations have either been implemented, no longer apply due to staff or contract changes, or are no longer applicable due to legislative or policy changes. We have invited the DC Auditor to return to follow-up on the agency's progress in correcting these issues, and feel that we have adequately addressed all issues concerning these reports. Over the past few months, the lines at the Inspection Station have increased dramatically. In fact, we have seen a 25% increase in vehicles served over the same period last year. The reasons for the increase include an increased awareness of the late fees and the increased enforcement efforts of the parking control aides which has resulted in more, tickets being issued for expired inspections. To date, we have collected over $450,000 in late fees over the last 13 months. We believe that the volume will continue for some time, since many people have not gotten to the end of their cycle for renewal. However, our new inspection renewal notice should mean fewer late fees being imposed if people adhere to the deadlines. To assist residents in getting their vehicles inspected, we are reopening the new inspection station in NE. The contract for construction is being administered by DDOT, and we are told that it is expected to be operational by Summer 2003. In addition, we have again asked for participation from area gas stations in the re-inspection program. To date, we have received letters of commitment from 13 stations. Lastly, we will continue to stress that residents can make appointments if the wait is over 30 minutes, and ask that those who make appointments keep them, since we have a 50% no-show rate on appointments. Additionally, everyone should understand that the station opens at 6 a.m. and is often crowded at that time due to residents lining up as early as 4:30 a.m. In any case, we have 8 lanes that are operational (except if down for maintenance) and we have full staff for the entire 12 hour day. The busiest days are Mondays and Saturdays, and the peak hours are weekdays from 11 a.m. to 3 p.m. In addition, now that the hot weather is here, the station will adhere to the "Code" days. This means that on Code Red days, the station is likely to close for a few hours during midday. We will post the schedule on our website and at the station. Just a note to anyone who may know someone who is handicapped and in need of service. The office at C St. is available to service anyone in need of a handicap placard, from 8:15 a.m. to 4:00 p.m. each day. In addition, placards may be renewed by mail. Lastly, the Inspection Station has a special lane for handicap and Senior residents that is available at all times during operating hours. We experienced a delay in processing the work from dealers of approximately 6 weeks. In early May, we met with a group of dealers and the Washington Area New Auto Dealer's Association to discuss various issues. In our discussions, DMV committed to reducing the turnaround time back to a S-day period, reopening Pennbranch as an office for walk-in dealer transactions, and communicating changes and new policies through WANADA. The dealers committed to providing the correct paperwork at all times, not sending runners to the offices for daily transactions, and providing correct payment for all transactions. We have been working with all dealers who have identified outstanding problems, and currently have a 6 day turnaround time. A great deal has been said about Brentwood and its operations. First, there was a misconception that Brentwood was opened to replace H St. In fact, Brentwood was opened as a fourth service center, not a replacement for one particular center. Second, Brentwood was opened with full cooperation and knowledge of the owners of the facility. In fact, part of our discussions included the issue of volume and parking. At no time was there an issue raised by management or the other tenants. Third, the volume at Brentwood is unfortunate, but unavoidable at this time. 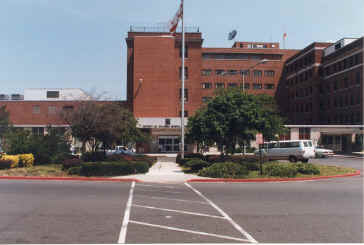 Residents have chosen to frequent this facility instead of Georgetown and Pennbranch, which tend to have smaller volumes. DMV has done all it can to address the parking and congestion issues including having our security personnel police the lot and direct traffic, working with the owners to post signs, and ensuring that employees are not utilizing spaces. We will continue to participate in discussions with the owners on what can be done to ease the problem, but DMV, nor the District government will take full and sole responsibility for the issues at Brentwood. The owners would have us be totally responsible for the actions of all customers to the center, even though we have no exclusive rights to any part of the facility. This is unfair and inappropriate. In our latest discussions, the owners have stated that they will hire a towing service to enforce the "No DMV parking" rules, and they have asked that we close the drive-thru service. They have also stated that they believe that DMV should pay for a parking attendant to patrol the retail spaces. We have told them that we will take the drive-thru into consideration, but will only pay our share of the parking attendant salary as a tenant in the facility. Once again we address the issue of contract monitoring as it relates to the two major contracts within DMV: ACS Ticket Processing and Ticket Collections, and Destiny. The ACS contract is monitored in several ways. First, we have a DMV staff person whose sole responsibility is to monitor the contractor and to ensure that they are following the terms of our contract. This includes performance, deliverables, and any new terms that are implemented. Second, we have created internal monitors as represented by the user community. They are charged with ensuring that the contractor meets the standards set forth in the contract. They evaluate these standards monthly and their findings are sent to the contractor for review, comment and correction. Third, the contract is monitored by the Office of Contracts and Procurement for accuracy and compliance to terms of the contract. Lastly, the contract is now being monitored by an independent auditor hired last year to do a baseline assessment and then to provide quarterly reports on the contractor's performance. With respect to the Destiny contract, there are also several parties involved in monitoring the contractor. First, there is the DMV project team which is looking at the deliverables and the work being done to our specifications. Second, there is the team from OCTO which is responsible for the administration of the contract, and handles all negotiations. Lastly, there is an independent auditor built into the process, and that firm has been monitoring the contract from the first day. Contrary to what has been said, we feel that we have the capability to monitor and hold our contractors accountable, and we are doing that in the case of both contracts. Each of these is under investigation by various sources, but now has been incorporated into the Destiny system as a security feature to avoid theft and fraud. It is our belief that, when fully implemented, we will have the capability to track every instrument and determine who and when a breach of security has occurred. The system is designed to catch issues such as duplicate tags and phony identification, before they can be used. Before I conclude, I want to take a moment to speak to the issue of customer service, specifically my staff at DMV. I must tell you all that I am proud of what we have accomplished in this agency. We have worked long and hard with our partners, the Executive Board of AFGE Local 1975, to address staff concerns, look at morale and create an environment that fosters good work and good service. This was essential to moving us forward, since resources had been neglected and so had the staff. I firmly believe that the majority of our staff are decent, hardworking, caring people who can and will make this agency great. We have come a long way, and although we have a long way to go, I feel good about the staff's commitment to getting there. I take offense to anyone's global characterization of the staff as lazy, uncaring, unprofessional, or rude. Yes, we have situations that arise that are not handled in the appropriate manner, and we deal with them individually. But I invite anyone with these criticisms to spend a day with our staff and see what they think then. I often work along side them in the various offices, and for the most part, they exhibit courtesy and respect, which is not afforded to them. They deal with verbal and physical abuse and are treated as servants. This is not acceptable. This is a difficult job, and is not one that can be taken lightly. I want to thank them publicly for all of their efforts, all negativity aside. I would also like to acknowledge all of the various partners that have helped us along the way. To US Airways, for their support in providing various training opportunities for our staff and managers. Ladies and gentlemen, the road is not easy, much as I wish it were. It is filled with many, many potholes that we are trying to fix at one time. As we attempt to be better and more efficient, we have created areas that we were not planning on entering. DMV is now positioned to be a premier enforcement and collection agency. We have built a system that finally does what it should have all long, and that is not popular, but very necessary. After all, what is the point of the Initiative on Child Support, if we do not intend on holding offenders accountable. What is the point of new parking control aides to enforce traffic and parking regulations, if we do not intend on ensuring that everyone is accountable. What is the point of having rules to protect us from unsafe, unqualified drivers or vehicles, if we are not going to enforce them. And finally, what is the point of continuing to accept a system that cannot do what we need, when we have one that can. As you know, DMV's around the country are often criticized for enforcing vehicular laws, mandating adherence to strict guidelines, imposing strict penalties for noncompliance, placing restrictions on driving activities and being overall watchdogs for millions of people each day. This means that many will be denied services and/or privileges, and are not happy. Hence, the dissatisfied customer, and my greatest challenge of all, customer satisfaction. I am often asked whether or not I am satisfied with the level of service being provided to the residents of DC. Anyone who knows me knows that satisfied is not a word often used in my vocabulary. I am always looking for the next greatest thing to make a situation better. However, what I can say is that I am comfortable that, at this moment in time, we have the necessary tools to move us forward. Our system is best in class, and we are now faced with the challenge of making all of these new efforts work to everyone's benefit. I clearly recognize that expectations were raised last year as we reduced wait times and introduced new processes. We did these by making basic short-term fixes, while having a system that was still broken. And we did it knowing that the long-tern process meant new systems soon. We were successful, and it would seem that things were going smoothly until we started testing Destiny. I now implore everyone to see Destiny for what it really is, a tool for greater efficiency. What we now have is a system that will take us into the future and enable long-term sustainability. Yes, it has brought us new challenges, ones which we have always had, but could never address fully. As we continue down this road, I again ask for patience as we work our plan for action, and we do have a plan. And also I ask that everyone understand that resources are not what we would like, but we get our share as does ever other agency in this government. We also get more than our share of responsibility whether it is based on new mandates from other agencies, new laws, or new systems that finally work. This process of rebirth for DMV will take time, and not just a few years. After all, it didn't get this way in a few years, and it cannot be cleaned up for good that quickly. I ask that our critics step back, remember the history, reflect on how far we have come and work with us to do what we need to do to make it better. We are building something that will last, and it will take time to happen. My dedication and that of my staff is clear. We may not solve all of these issues today or tomorrow, and new ones may crop up over time, but we will move this agency forward and we will be the best in the nation. Of that I am sure! As always, I thank you all for this opportunity to serve, for the chance to speak to you today, and for allowing me to address you concerns. I am happy to answer your questions. Good afternoon Chairperson Schwartz and members of the Committee on Public Works and the Environment. I am Suzanne Peck, Chief Technology Officer of the District of Columbia. I'm pleased to be able to appear before you today to present an overview of the DMV's new DESTINY system. DESTINY is the District's new, $19MM, full-function, integrated motor vehicle system. DESTINY replaces the antiquated, 30-year-old Motor Vehicle Information System (MVIS). DESTINY has been a 21-month project (August 2000 - May 2002) released in 3 phases over a period of 6 months (in November of last year, and March and April of this). During this period we also installed DESTINY on a new mainframe platform (9672-R25 IBM mainframe from RS-6000 mid-range machine), installed a new generation of communications switching services to all DMV locations (frame relay vs. SwitchedMultimegabitDataServices), and installed the new network and the new system in one renovated and 3 new service locations. Final test and project closeout phases for DESTINY are expected to complete by early fall. During this six months DESTINY has operated well, and exactly as it was designed to do. Despite the fact that DESTINY had to replace MVIS seamlessly - the equivalent of having to "make the bed while people are still sleeping in it"- DESTINY has experienced only one customer-visible slowdown period - the day of May 3 - during its six months of initial test operation. This is nearmiraculous for a system as complex as DESTINY, with over 1 MM lines of COBOL code. DESTINY is an exceptionally robust customer service system. For residents it handles all driver's license, vehicle registration, testing, inspection, titling, tagging and permitting functions. For the District it creates a single customer identity that allows all information about drivers and their vehicles to be accessed simultaneously for quick, efficient, one-stop processing at DMV service locations. Anyone who owes these obligations to the District must square them away first before receiving new driver .or vehicle authorizations. DESTINY also has an outstanding suite of online services. We've implemented every DMV service possible on the District's web site - every DMV vehicle, driver, general, and special authorization service that doesn't require the resident's physical presence (such as first time driver's license) is now available at www.dmv.dc.gov. One of DESTINY'S principal resident benefits is that it allows citizens to "skip the trip" and to renew their driver's licenses and vehicle registrations on line. Among other features, residents can also pay their tickets online, request their driver's record, request a duplicate driver's license, and schedule their road test appointments. One of the key solutions to the long lines currently being experienced at DMV locations is to have a high adoption rate for these new online applications. If 30-50% of residents use these applications to renew their driver's licenses, renew their vehicle registrations, and to pay their tickets, a tremendous stress will be removed from the brick and mortar service location counters. A list of other resident benefits is listed on the DESTINY BENEFITS posterboard. This posterboard also lists the principal benefits of DESTINY in producing a safer, cleaner, more enforcement-compliant District. A quick browse of the MVIS/DESTINY Business Capabilities Comparison posterboard details how much stronger and more sophisticated DESTINY is in providing integrated service, enforcement, data accuracy, and security functions to District residents and to DMV counter personnel who service residents. It is a best-of-class system. DESTINY is one leg of a three-legged stool - systems, processes, and people. As Sherryl has said, DESTINY was intended to, and IS solving DMV's systems problems. In the short term she and her managers are wrestling with the additional challenges of simultaneously serving the public AND of learning a new system. They're wrestling with putting into place agency processes to support the broad new service and enforcement functions now available in DESTINY. And they're working through the transition period problems DMV faces in digesting such a broadly capable system. With the implementation of DESTINY, a variety of DMV on line services is now available on the District's web portal. When compared state-by-state with online DMV functions offered by other states, the District now has MORE online DMV functions than any other state. In terms of number of functions available, the District now has 23 DMV functions available online. Virginia has 15, NY has 12, and Arizona has 11. As with much else we're doing with technology in the District, we've been very determined to move from "worst to first" with our online DMV offerings. And to position our online services to be so quick and efficient that residents will opt to "skip the trip" and elect to get their DMV services from their own homes and offices. And residents have been appreciative of these online services. You can see on the "Online Registration Renewal" posterboard their very positive comments about the service. They've also been very helpful in helping us find problems and repair them early. The "control number" problems which is the heart of 4 of 5 of the negative comments has already been repaired. And lastly, I'd like to speak to contract management of the DESTINY contract. Contract management of this project has been particularly strong. Since inception, the District obtained the services of a Project Management and IV&V Contract, called the PCT (Project Management, Contract Administration, Technical Management). The role of the PCT was to ensure that all contract requirements were met, review all deliverables for correctness and to assist the District in providing technical support and testing. The District assigned an OCTO Project Manager (Michele Spence), an OCTO Contract Administration Manager (Allam Al-Alami) and a DMV Program Manager (Michael Teller). Several DMV and OCTO management and technical support personnel were located at the project site throughout the contract, involved for quality assurance. The project Executive Steering Committee, consisting of myself, Sherryl Hobbs Newman, and other senior project staff members, held a regular monthly meeting to review progress and resolve issues, plus held other meetings as needed. Regular weekly progress meetings were conducted throughout the project period (since August 2000) with representatives from DMV, OCTO, Deloitte Consulting, and the PCT to review all project activities. A project Risk Review meeting was conducted bi-weekly throughout the entire project with representatives from DMV, OCTO, Deloitte Consulting and the PCT to discuss all issues causing, or potentially contributing to, project quality concerns or schedule delays. And a project schedule meeting was conducted weekly throughout the execution of the project with representatives from DMV, OCTO, Deloitte Consulting and PCT which focused exclusively on schedule matters. With me this afternoon are Bruce Witty, OCTO's Contracts and Procurement Chief, Allam AlAlami, DESTINY'S OCTO Contract Administration Manager, and Paul Cook, the PCT lead, who can answer any additional questions you have about DESTINY contract management. Thank you for this opportunity to address the committee and to report on the implementation of the new DESTINY system.